Wonderful combination of the grassy plains of the Serengeti, the wildlife-dense expanses of the Ngorongoro Crater and the brilliantly blue waters and otherworldly coral of Mnemba Island. The chance to enjoy intimate experiences such as walking safaris, hot-air ballooning and witnessing the migration calving, as well as crater excursions, exclusive scuba diving, swimming with dolphin and watching the sun set from a dhow. 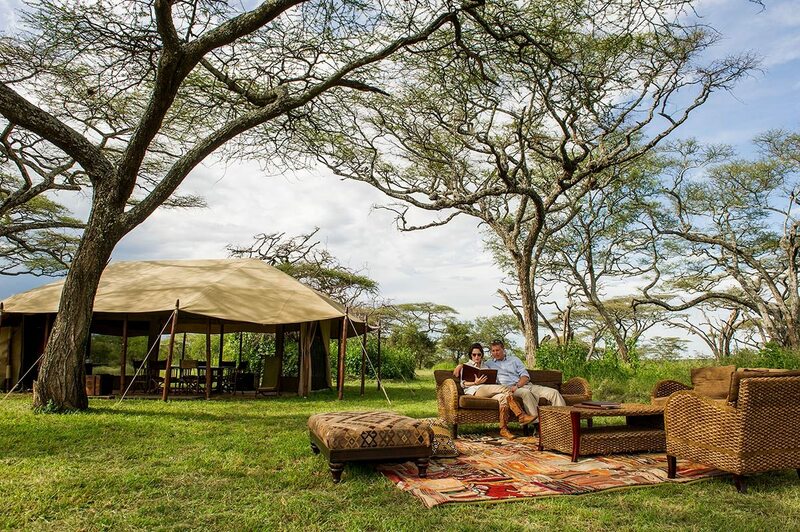 A range of luxury accommodation from an elegant safari tent in the heart of the grassy plains at Serengeti Mobile Camp, a stilted cottage on the crater rim at Ngorongoro Crater Lodge, and a guest banda tucked into the tropical forest next to the beach at Mnemba Island. 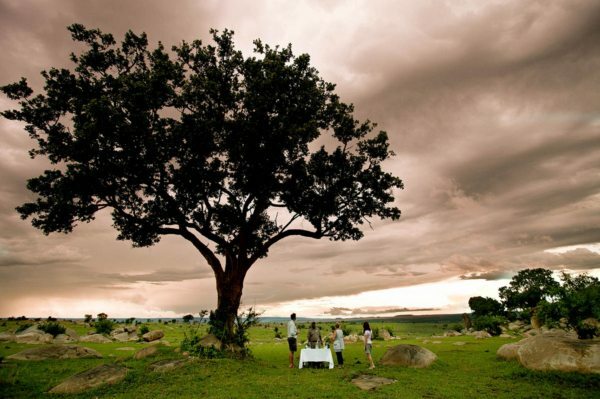 For more information see Serengeti Mobile Camp, Ngorongoro Crater Lodge and Mnemba Island. The journey from Arusha into the Serengeti flew by as we peered out the windows of our plane, eager for a glimpse of the legendary wildlife. My partner was the first to see elephant, pointing out a large herd moving gracefully through the grasses. After landing, we transferred to Serengeti Mobile Camp, which has three locations in the Serengeti that follow the Great Wildebeest Migration – now perfectly placed to view the wildebeest calvings. We then settled into our luxury safari tent, which had a king-sized bed draped romantically in mosquito nets, and a heated bucket shower to freshen up.After meeting our private guide and tracker, we set off early on our game drive, thrilled at the prospect of witnessing the wildebeest calving firsthand, a phenomenon which only occurs from late January to mid-March. It was moments before we drove onto the plain and into a vast herd of wildebeest, who were unbothered by our presence. All around us, gawky creatures staggered up from underneath wildebeest cows, rising and falling until they found their feet, while the more confident ones frolicked in youthful exuberance. We stayed there for hours, spellbound. It was truly a miracle of nature.A hot-air balloon safari was the most romantic way to celebrate the last day of our honeymoon in the Serengeti, and we held each other as we gently rose into the air. We were silent in our wonder: there were no fences and hardly any roads, just African savannah and acacia trees bathed in soft morning light. We soared above the wildebeest, calving in perfect synchronicity while a pride of lion gorged themselves nearby. After landing, we enjoyed sparkling wine and breakfast in the bush. 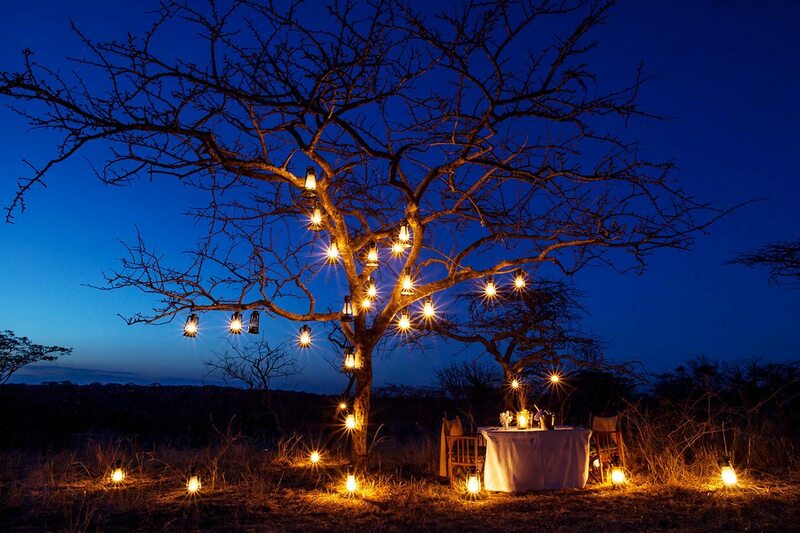 The day culminated with a private dinner and a night drive under the dazzling African sky. The journey from Arusha into the Serengeti flew by as we peered out the windows of our plane, eager for a glimpse of the legendary wildlife. My partner was the first to see elephant, pointing out a large herd moving gracefully through the grasses. After landing, we transferred to Serengeti Mobile Camp, which has three locations in the Serengeti that follow the Great Wildebeest Migration – now perfectly placed to view the wildebeest calvings. 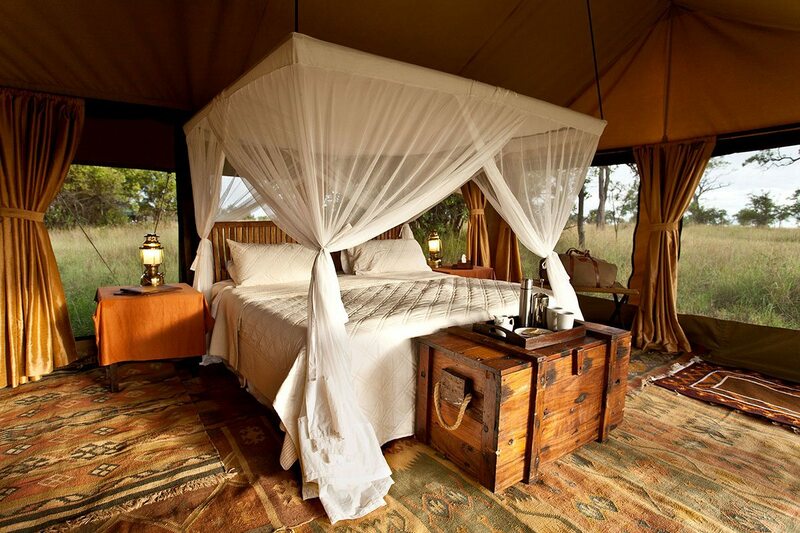 We then settled into our luxury safari tent, which had a king-sized bed draped romantically in mosquito nets, and a heated bucket shower to freshen up. After meeting our private guide and tracker, we set off early on our game drive, thrilled at the prospect of witnessing the wildebeest calving firsthand, a phenomenon which only occurs from late January to mid-March. It was moments before we drove onto the plain and into a vast herd of wildebeest, who were unbothered by our presence. All around us, gawky creatures staggered up from underneath wildebeest cows, rising and falling until they found their feet, while the more confident ones frolicked in youthful exuberance. We stayed there for hours, spellbound. It was truly a miracle of nature. A hot-air balloon safari was the most romantic way to celebrate the last day of our honeymoon in the Serengeti, and we held each other as we gently rose into the air. We were silent in our wonder: there were no fences and hardly any roads, just African savannah and acacia trees bathed in soft morning light. We soared above the wildebeest, calving in perfect synchronicity while a pride of lion gorged themselves nearby. After landing, we enjoyed sparkling wine and breakfast in the bush. The day culminated with a private dinner and a night drive under the dazzling African sky. On the morning before we flew on to Ngorongoro Crater, we had time to enjoy a fascinating walking safari through the Serengeti, discovering a new perspective on its diverse ecology before taking to the skies for one last aerial perspective.After planning our honeymoon for so long, each aspect of Ngorongoro Crater Lodge seemed dream-like in reality – not least because of its location on the very edge of the crater, peering down 600m onto a shimmering lake. Our stilted cottage was fit for royalty and we felt completely spoilt as we tested its plush bed and cut velvet sofas and breathed in the fragrance of fresh-cut roses. A roaring fire had been lit in our indoor fireplace and a bubble-bath drawn, scattered with rose petals. We enjoyed a long soak before our elegant private dinner and wine pairing in the cellar.Staying so close to the crater had a big benefit – we could enjoy a full English breakfast before we began uncovering this magnificent caldera. We spotted several bird species and a rare black rhino in its forests, but exploring the crater floor was undoubtedly the day’s highlight – from herds of elephant, zebra and wildebeest to snoozing lion and a flock of flamingos that soared into the air, we felt like we saw it all. Next up was a rose-petal picnic with the dramatic backdrop of the crater rim and forest beyond, surrounded by the innumerable game of Ngorongoro. On the morning before we flew on to Ngorongoro Crater, we had time to enjoy a fascinating walking safari through the Serengeti, discovering a new perspective on its diverse ecology before taking to the skies for one last aerial perspective. 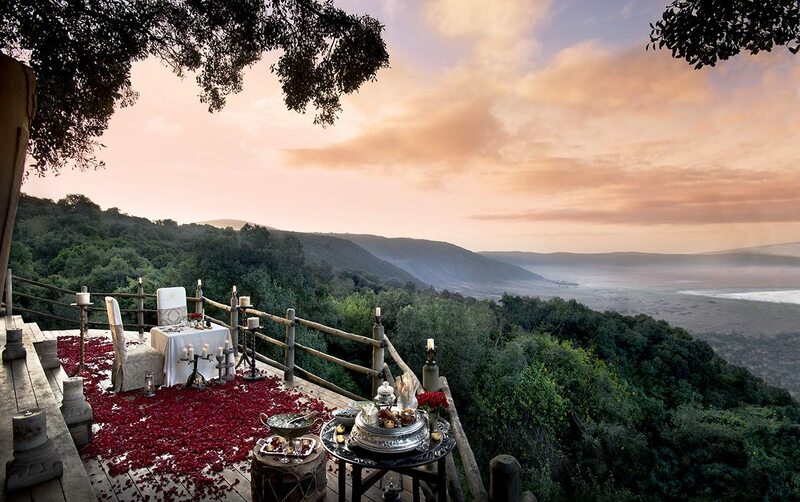 After planning our honeymoon for so long, each aspect of Ngorongoro Crater Lodge seemed dream-like in reality – not least because of its location on the very edge of the crater, peering down 600m onto a shimmering lake. Our stilted cottage was fit for royalty and we felt completely spoilt as we tested its plush bed and cut velvet sofas and breathed in the fragrance of fresh-cut roses. A roaring fire had been lit in our indoor fireplace and a bubble-bath drawn, scattered with rose petals. We enjoyed a long soak before our elegant private dinner and wine pairing in the cellar. Staying so close to the crater had a big benefit – we could enjoy a full English breakfast before we began uncovering this magnificent caldera. We spotted several bird species and a rare black rhino in its forests, but exploring the crater floor was undoubtedly the day’s highlight – from herds of elephant, zebra and wildebeest to snoozing lion and a flock of flamingos that soared into the air, we felt like we saw it all. 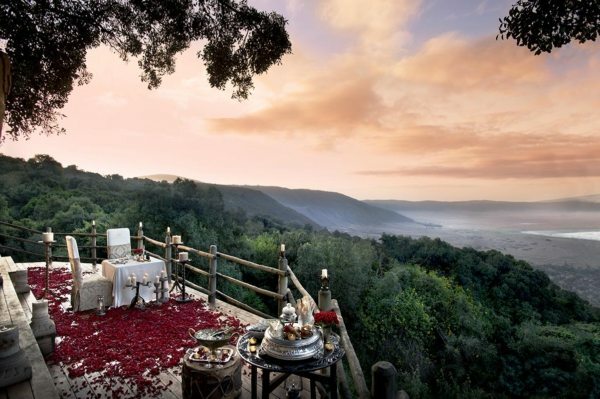 Next up was a rose-petal picnic with the dramatic backdrop of the crater rim and forest beyond, surrounded by the innumerable game of Ngorongoro. An island paradise off the northeast coast of Zanzibar was the last destination on our Tanzania honeymoon safari, and we enjoyed a seamless flight and scenic boat transfer to Mnemba Island. The lodge was imbued with romance, with bandas set along a palm-fringed beach of white sands and water that was every shade of blue. We walked everywhere, marvelling at the feel of the powdery white sand between our toes, and the balmy waters of the Indian Ocean. A fresh seafood dinner was served on the beach, lit with nothing but candles and the bright night sky.We slept in the next day, indulging in the comforts of our suite before forgoing a shower for a morning swim in the still ocean waters. We couldn’t wipe the smiles off our faces as we built a sandcastle and then buried ourselves next to it – to the amusement of our butler who walked past and laughed indulgently at our childlike antics. A leisurely breakfast became brunch, and we spent the rest of the day lying on Zanzibari loungers with cocktails in hand. We ended the day with drinks in the makuti-thatched bar and dining area, planning our deep-sea dive for the next morning.We’d heard Mnemba Atoll had some of the world’s best diving – and after recently acquiring our Padi certification, we were keen to practise. We donned our gear and tipped backwards into the calm ocean, descending a reef wall that teemed with aquatic life and magical coral. Having a boat to ourselves meant we could lunch on board and dive once again, this time exploring a shallow reef with coral of all colours, sizes and shapes. We discovered all the usual suspects as well as blue-spotted stingray, turtle and a whitetip reef shark, leaving overjoyed, and hungry for more!We hadn’t made plans for the following day, and it was just as well: dolphin had been spotted nearby, and along with some other lucky guests we were invited to go on a spontaneous dolphin-swimming adventure! Thrilled, we jumped into a rubber duck, scanning the horizon until a sudden shout from the bow turned us towards the distant sight of dancing fins. We put our masks and snorkels on and slipped overboard, careful to be sensitive about not scaring our new (and completely wild) friends away. All around us were lithe grey shapes and the sound of whistles and clicking as if they were communicating with us. As a dolphin brushed by, we grabbed each other’s hands, united in wonder and unbridled happiness.At low tide, we explored the island on foot, careful not to disturb the nesting sites of the green sea turtles that breed here. We were thrilled to spot both the island’s two resident antelope species, the suni and the endangered Ader’s duiker. We left just before sundown on our dhow cruise, swept away by the undeniable romance of sailing into the sunset as sultans and traders once did. Escorted by a school of dolphin, we watched with G&Ts in hand as the sun descended with the sails of fishing dhows headed home for the night dotting the horizon.We woke early the next morning for another dive, marvelling at the incredible visibility of Mnemba Island, seemingly at any time of day. We swam next to parrot fish, Moorish idols, clownfish and even the endemic and elusive Zanzibar butterflyfish. We also discovered ghost pipe fish, leaf fish, wrasses and nudibranchs. After steaming mugs of hot chocolate, we returned to the lodge, feeling elated. While my partner went off to read a book, I enjoyed an afternoon nap before a shower and dinner, which was served on a private table right on the beach, under the tropical night sky.We were both startled to realise we’d reached our last day – time had swept by in the most languid and enjoyable of fashions, and we meant to make the most of our last moments. 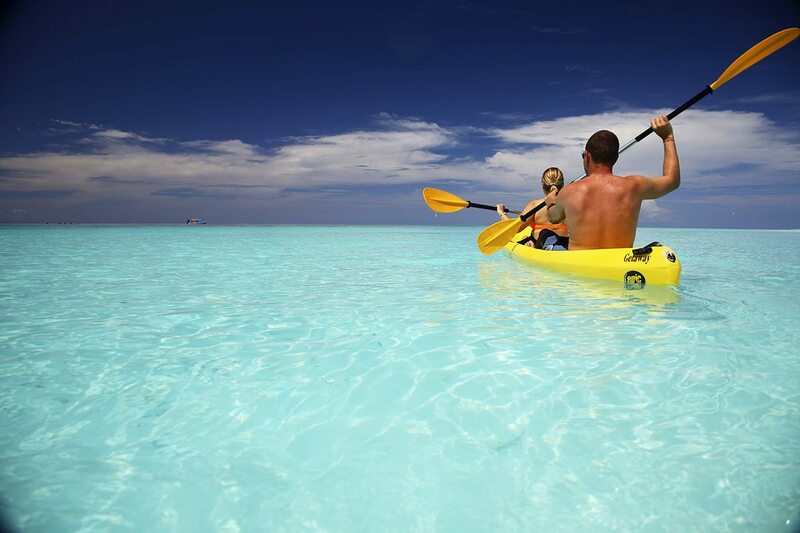 After a morning snorkel, we had a picnic on the beach and then explored the islands on a deep-sea kayak made for two. We paddled along the shoreline before heading out to deeper waters to look for dolphin and sea turtle. Back at the lodge, we enjoyed a massage before dinner and a last moonlit swim – surrounded by phosphorescence that trailed our every movement! 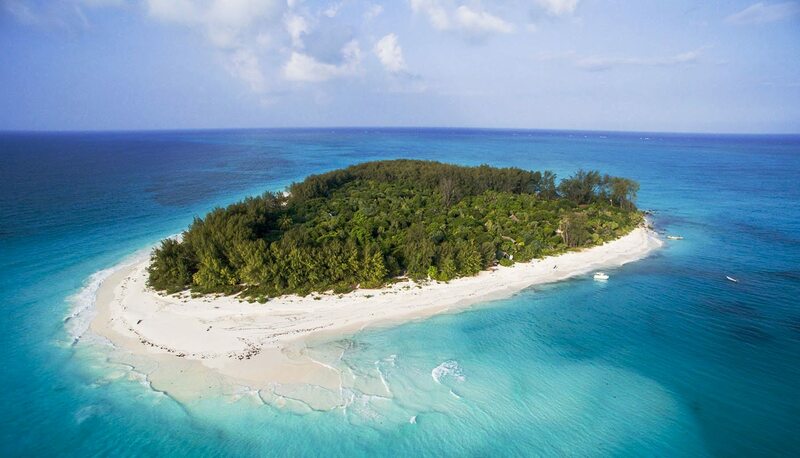 An island paradise off the northeast coast of Zanzibar was the last destination on our Tanzania honeymoon safari, and we enjoyed a seamless flight and scenic boat transfer to Mnemba Island. 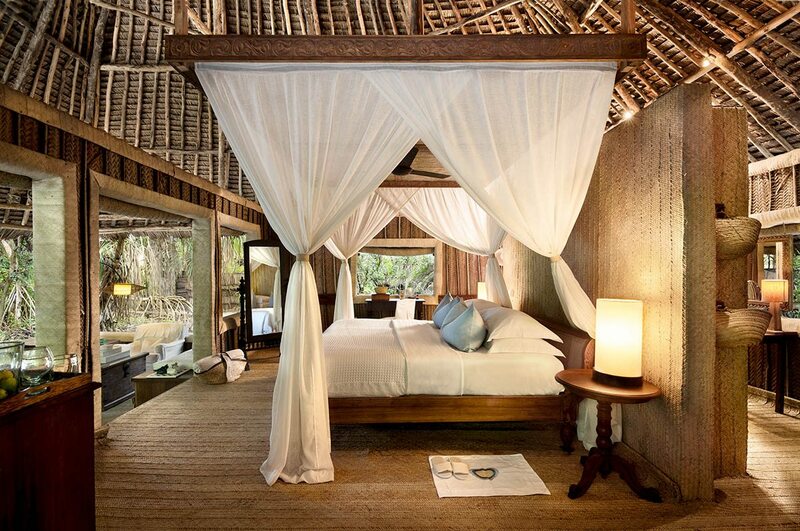 The lodge was imbued with romance, with bandas set along a palm-fringed beach of white sands and water that was every shade of blue. We walked everywhere, marvelling at the feel of the powdery white sand between our toes, and the balmy waters of the Indian Ocean. A fresh seafood dinner was served on the beach, lit with nothing but candles and the bright night sky. We slept in the next day, indulging in the comforts of our suite before forgoing a shower for a morning swim in the still ocean waters. We couldn’t wipe the smiles off our faces as we built a sandcastle and then buried ourselves next to it – to the amusement of our butler who walked past and laughed indulgently at our childlike antics. 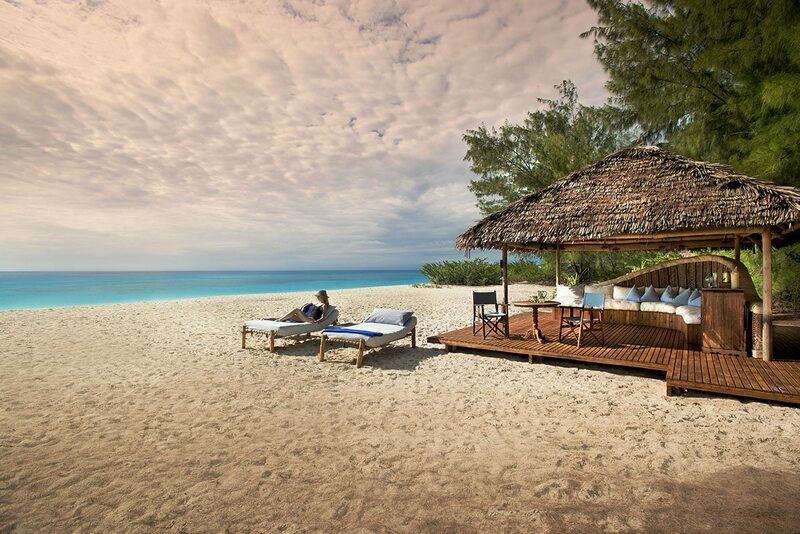 A leisurely breakfast became brunch, and we spent the rest of the day lying on Zanzibari loungers with cocktails in hand. We ended the day with drinks in the makuti-thatched bar and dining area, planning our deep-sea dive for the next morning. We’d heard Mnemba Atoll had some of the world’s best diving – and after recently acquiring our Padi certification, we were keen to practise. We donned our gear and tipped backwards into the calm ocean, descending a reef wall that teemed with aquatic life and magical coral. Having a boat to ourselves meant we could lunch on board and dive once again, this time exploring a shallow reef with coral of all colours, sizes and shapes. We discovered all the usual suspects as well as blue-spotted stingray, turtle and a whitetip reef shark, leaving overjoyed, and hungry for more! We hadn’t made plans for the following day, and it was just as well: dolphin had been spotted nearby, and along with some other lucky guests we were invited to go on a spontaneous dolphin-swimming adventure! Thrilled, we jumped into a rubber duck, scanning the horizon until a sudden shout from the bow turned us towards the distant sight of dancing fins. We put our masks and snorkels on and slipped overboard, careful to be sensitive about not scaring our new (and completely wild) friends away. All around us were lithe grey shapes and the sound of whistles and clicking as if they were communicating with us. As a dolphin brushed by, we grabbed each other’s hands, united in wonder and unbridled happiness. At low tide, we explored the island on foot, careful not to disturb the nesting sites of the green sea turtles that breed here. We were thrilled to spot both the island’s two resident antelope species, the suni and the endangered Ader’s duiker. We left just before sundown on our dhow cruise, swept away by the undeniable romance of sailing into the sunset as sultans and traders once did. Escorted by a school of dolphin, we watched with G&Ts in hand as the sun descended with the sails of fishing dhows headed home for the night dotting the horizon. We woke early the next morning for another dive, marvelling at the incredible visibility of Mnemba Island, seemingly at any time of day. We swam next to parrot fish, Moorish idols, clownfish and even the endemic and elusive Zanzibar butterflyfish. We also discovered ghost pipe fish, leaf fish, wrasses and nudibranchs. After steaming mugs of hot chocolate, we returned to the lodge, feeling elated. While my partner went off to read a book, I enjoyed an afternoon nap before a shower and dinner, which was served on a private table right on the beach, under the tropical night sky. We were both startled to realise we’d reached our last day – time had swept by in the most languid and enjoyable of fashions, and we meant to make the most of our last moments. After a morning snorkel, we had a picnic on the beach and then explored the islands on a deep-sea kayak made for two. We paddled along the shoreline before heading out to deeper waters to look for dolphin and sea turtle. Back at the lodge, we enjoyed a massage before dinner and a last moonlit swim – surrounded by phosphorescence that trailed our every movement! 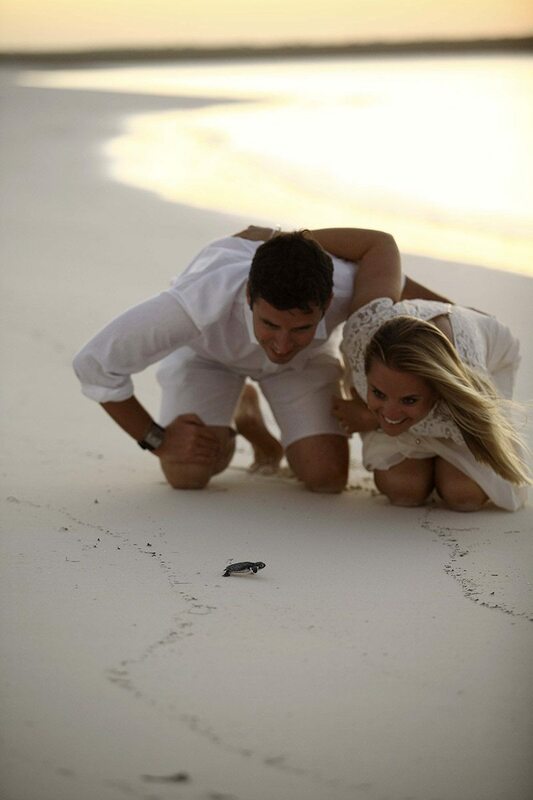 Once couldn’t have asked for a more romantic Tanzania honeymoon safari than this. Even though we’d researched and planned every aspect, we couldn’t have envisioned the reality of these stunning places and experiences.It wasn’t possible to know the wonder, excitement and sheer romance of sharing some of these experiences together – toasting the dying sun from a dhow, diving the mysterious depths of the Indian Ocean or witnessing a mother birthing a wildebeest calf. Nor could we anticipate the personal and attentive touches of the guides, trackers, chefs, housekeeping staff and managers who went beyond the call of duty to make our honeymoon memorable.Although the Serengeti, Ngorongoro and Mnemba Island are quite different in their scenery and landscapes, they all shared a remarkable sense of place, with an openness and sweeping sense of space that seemed like an invitation, an embrace. Whether we were on a game drive, a walking safari or a dhow trip, we opened our hearts to the beauty around us, and felt a deep and abiding connection to the powerful force of nature that encompasses us all.It was an overwhelming sensory experience that made us feel alive in ways we’d never felt before, like walking the savannah feeling the cool breeze on our faces as we learned about tracks and signs, all the while knowing we were in big predator country. Or hearing the dawn chorus of the awakening plains or the midnight yelp of a jackal. We still can’t decide on a favourite memory as it was the sum of all experiences that made this a safari that will linger on in our hearts for years to come. 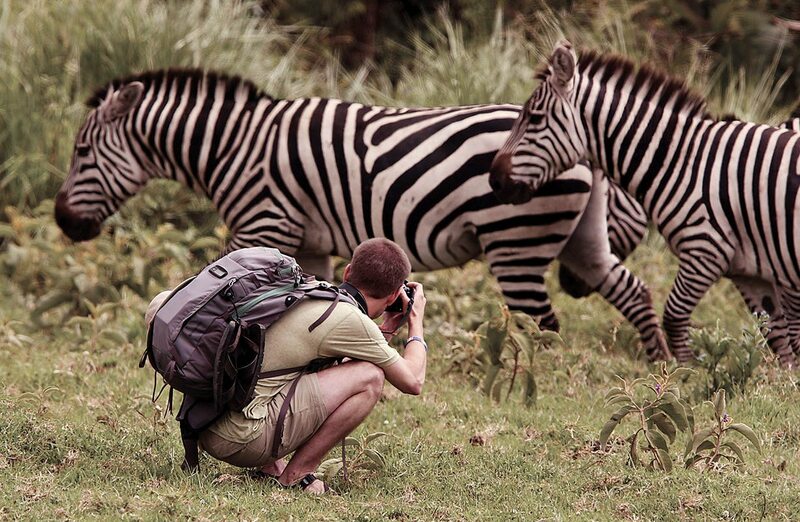 Once couldn’t have asked for a more romantic Tanzania honeymoon safari than this. Even though we’d researched and planned every aspect, we couldn’t have envisioned the reality of these stunning places and experiences. It wasn’t possible to know the wonder, excitement and sheer romance of sharing some of these experiences together – toasting the dying sun from a dhow, diving the mysterious depths of the Indian Ocean or witnessing a mother birthing a wildebeest calf. 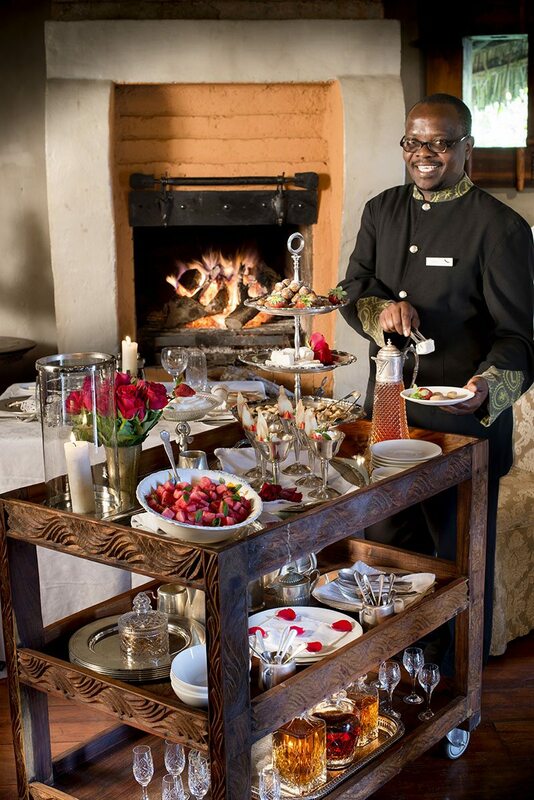 Nor could we anticipate the personal and attentive touches of the guides, trackers, chefs, housekeeping staff and managers who went beyond the call of duty to make our honeymoon memorable. Although the Serengeti, Ngorongoro and Mnemba Island are quite different in their scenery and landscapes, they all shared a remarkable sense of place, with an openness and sweeping sense of space that seemed like an invitation, an embrace. 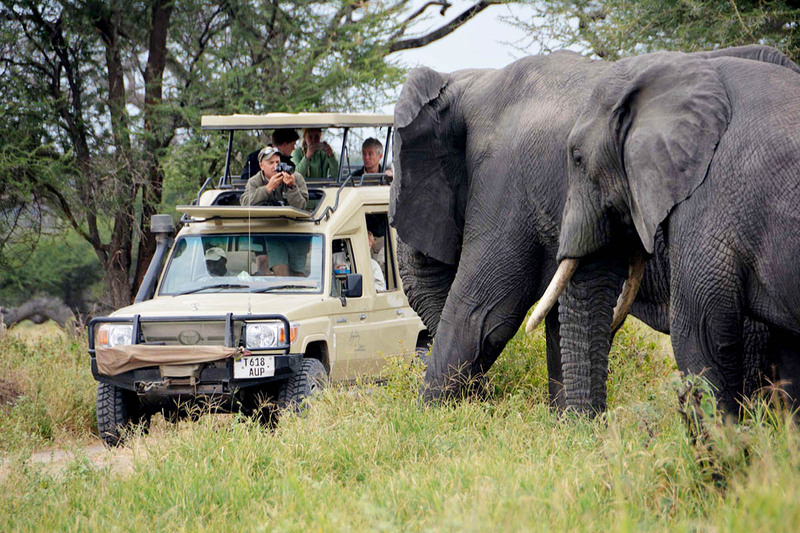 Whether we were on a game drive, a walking safari or a dhow trip, we opened our hearts to the beauty around us, and felt a deep and abiding connection to the powerful force of nature that encompasses us all. It was an overwhelming sensory experience that made us feel alive in ways we’d never felt before, like walking the savannah feeling the cool breeze on our faces as we learned about tracks and signs, all the while knowing we were in big predator country. Or hearing the dawn chorus of the awakening plains or the midnight yelp of a jackal. We still can’t decide on a favourite memory as it was the sum of all experiences that made this a safari that will linger on in our hearts for years to come. 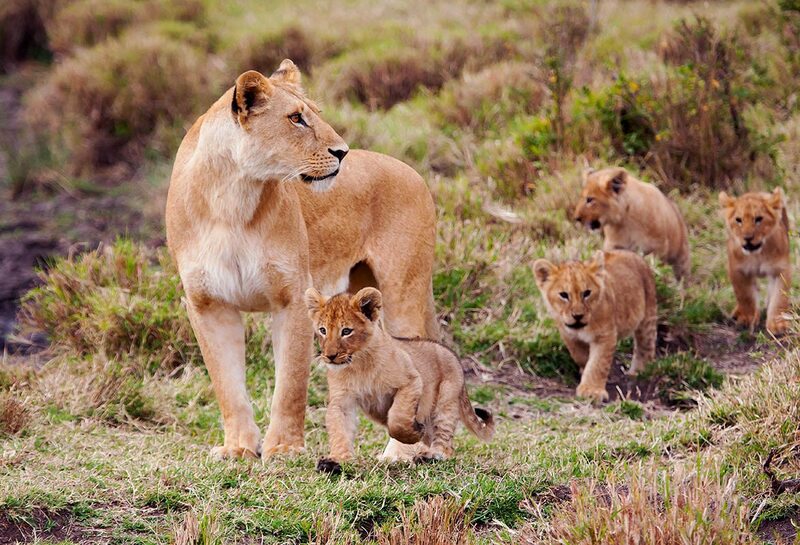 Lionesses look after each other’s cubs, so these Serengeti cuties might not be siblings. You’ll be met as you disembark from your international flight at Arusha Airport in Arusha, and assisted through customs and immigration. After a scheduled light-aircraft flight to the Serengeti, a transfer will take you to Serengeti Mobile Camp, where you’ll spend three nights. After a transfer from Serengeti Mobile Camp to the airstrip, you’ll take a scheduled light-aircraft flight to Lake Manyara. 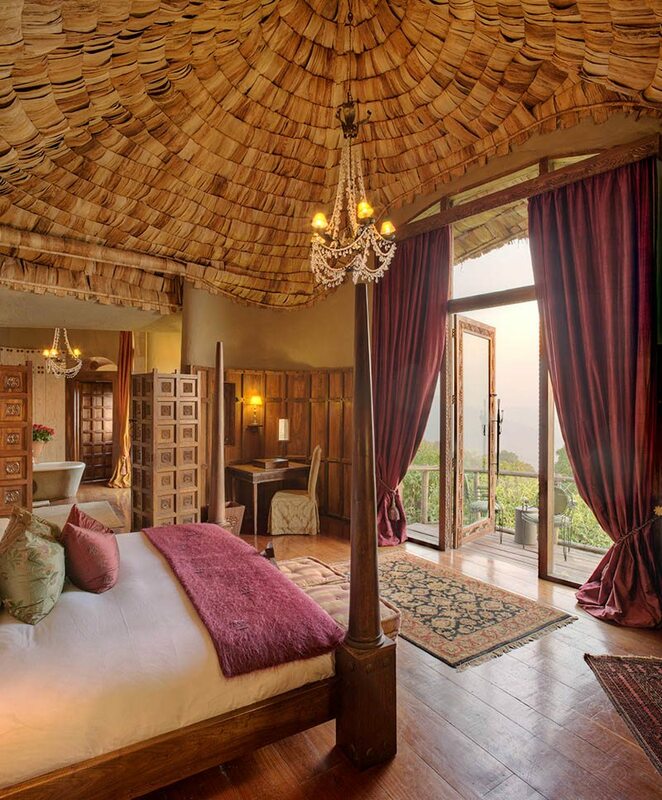 A transfer will then take you to Ngorongoro Crater Lodge, where you’ll spend two nights. After a transfer from Ngorongoro Crater Lodge to Lake Manyara, you’ll take a scheduled light-aircraft flight to Zanzibar. 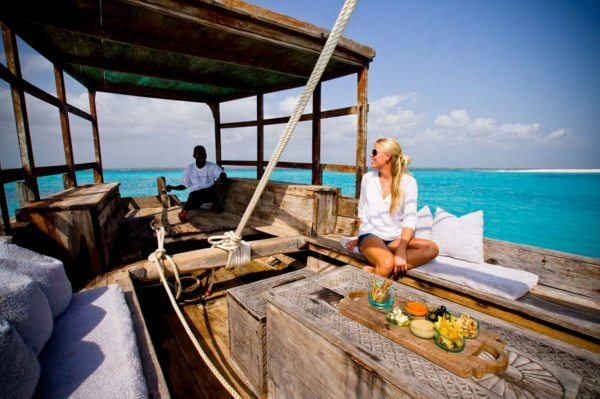 A transfer will take you to Mnemba Crossing Point, and a boat will take you to Mnemba Island, where you’ll spend seven nights. After a boat ride to Mnemba Crossing Point, a transfer will take you to the airport. A scheduled light-aircraft flight will then take you to Arusha Airport, to connect with your international flight.